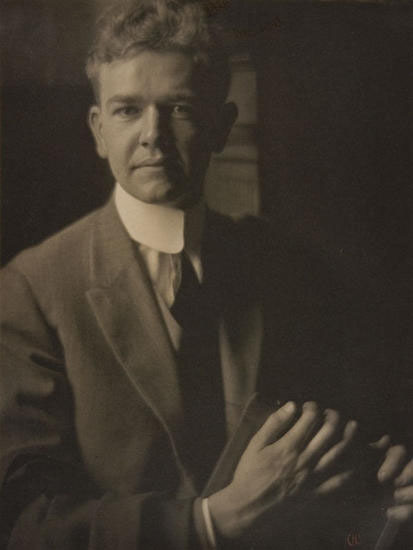 Photographer and cinematographer Karl Struss in 1912, photographed by Clarence H. White. Karl Struss, A.S.C. (November 30, 1886 – December 15, 1981) was an American photographer and a cinematographer of the 1900s through the 1950s. He was also one of the earliest pioneers of 3-D films. While he mostly worked on films, such as F. W. Murnau's Sunrise: A Song of Two Humans and Charlie Chaplin's The Great Dictator and Limelight, he was also one of the cinematographers for the television series Broken Arrow and photographed 19 episodes of My Friend Flicka. Karl Struss was born in New York, New York, in 1886. After an illness in high school, Karl's father, Henry, removed his son from school and placed him as a labor operator at Seybel & Struss bonnet wire factory. He began to develop an interest in photography, experimenting with an 8 x 10 camera, and, beginning in 1908, attended Clarence H. White's evening art photography course at Teachers College, Columbia University, concluding his studies in 1912 Early in his studies, he explored the properties of camera lenses and eventually invented, in 1909, what he attempted to patent as the Struss Pictorial Lens, a soft-focus lens This lens was considered popular with pictorial photographers of the time. The Struss Pictorial lens was the first soft-focus lens introduced into the motion picture industry in 1916. At the suggestion of Coburn, Struss submitted prints to the American Invitational Section of the annual exhibition of the Royal Photographic Society in London, initiating an exhibiting practice he would continue into the 1920s. He also participated in numerous exhibitions organized by photography clubs and other associations, including the Pittsburgh Salon of National Photographic Art and the annual photography display organized by the Philadelphia department store Wanamaker's. As Struss continued his exhibitions and specialized commissions, he produced commercial photography for magazines including Vogue, Vanity Fair, and Harper's Bazaar. (However, he was quick to insist that he was not doing fashion photography.) His photographic practice was interrupted by World War I. In 1917, he registered for the draft and then enlisted with the aim of fulfilling his military service through photography. He trained to teach aerial photography but an investigation into Struss's German affiliations launched by the Military Intelligence Department led to his demotion from the rank of Sergeant to private and, after a limbo period in confinement in Ithaca, New York, where he had originally gone to teach in the new School of Military Aeronautics, a transfer to Fort Leavenworth to serve as a prison guard and then as a file clerk. In the latter role, he took up photography again, documenting the prisoners. Near the close of the war, in an attempt to clear his record of rumors of anti-Americanism, he applied and was accepted into Officer's Training Camp at the rank of corporal. While Struss was eventually honorably discharged, it is likely that the failure of his business in New York in his absence and the fracturing of many of his professional relationships in the wake of the military investigation led him to be disinclined to resume his former roles in New York. From 1931 through 1945, Struss worked as a cameraman for Paramount, where he worked on a variety of material including films featuring Mae West, Bing Crosby, and Dorothy Lamour Struss also aimed to shape the field through publishing; for example, in 1934 he authored "Photographic Modernism and the Cinematographer" for American Cinematographer. Struss was later admitted to the American Society of Cinematographers, and was a founding member of the Academy of Motion Picture Arts. In 1949, while working as a freelancer, he began his work in "stereo cinematography", becoming one of the first proponents of that art form. Unfortunately, he did most of his 3D film work in Italy and none of his films were subsequently released in 3D in the United States. Struss's photographic archive of exhibition prints, film stills, negatives and papers (3 linear feet of materials) is available at the Amon Carter Museum of American Art located in Fort Worth, Texas. In his career, Struss was nominated for an Academy Award for Best Cinematography four times. The first time, and the only time he won, was for F. W. Murnau's Sunrise: A Song of Two Humans in 1929, sharing that award with Charles Rosher. He was nominated again in 1932 for Dr. Jekyll and Mr. Hyde, in 1934 for The Sign of the Cross, and in 1942 for Aloma of the South Seas with Wilfred M. Cline, A.S.C. and William E. Snyder, A.S.C. ^ McCandless, Barbara; Yochelson, Bonnie; Koszarski, Richard (1995). New York to Hollywood, The Photography of Karl Struss. "A Commitment to Beauty". Fort Worth, TX: Amon Carter Museum. pp. 14, 17. ISBN 0-8263-1637-9. ^ New York to Hollywood 1995, pp. 19, 92. ^ New York to Hollywood 1995, pp. 20-21. ^ a b c McCandless, Barbara (1999). Struss, Karl Fischer. Cary, North Carolina: American National Biography. pp. 57–59. ^ New York to Hollywood 1995, pp. 24-25. ^ New York to Hollywood 1995, p. 30. ^ New York to Hollywood 1995, p. 33. ^ New York to Hollywood 1995, pp. 34-35. ^ New York to Hollywood 1995, pp. 35-41. ^ New York to Hollywood 1995, p. 42. ^ New York to Hollywood 1995, p. 43. ^ New York to Hollywood 1995, p. 48. ^ New York to Hollywood 1995, p. 50. ^ New York to Hollywood 1995, pp. 179-180. ^ New York to Hollywood 1995, p. 181. ^ New York to Hollywood 1995, p. 182-183. ^ Brown, Turner; Partnow, Elaine (1983). "Karl Struss". MacMillan Biographical Encyclopedia of Photographic Artists and Innovators. MacMillan Publishing Co. ISBN 978-0-02-517500-6. Wikimedia Commons has media related to Karl Struss. This page was last edited on 6 April 2019, at 00:35 (UTC).